Our group left DFW Airport Saturday afternoon and flew through the night arriving at Gatwick Airport outside London about 5:00 AM, Sunday, London time (that was 11:00 PM Fort Worth time). Since we were flying so far north, we never lost sight of light. 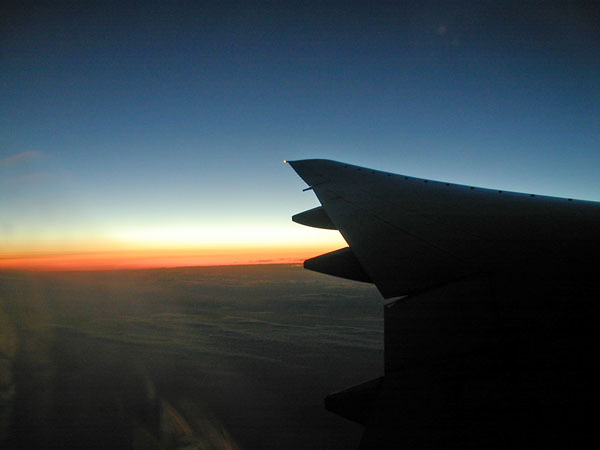 This photograph is out of the left side of the plane (north). I believe we had flown over Nova Scotia and were now over the Atlantic Ocean. 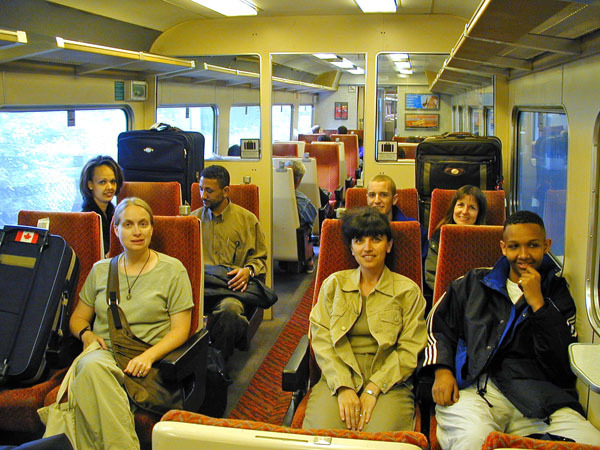 After we finally connected with the people who were supposed to meet us at the airport, we hopped on the Gatwick Express to Victoria Station. The photo at the left is our crew. From there we took a taxi (a truly frightening experience) to our hotel. Our rooms were not ready yet (it wasn't even close to normal check-in time), so we went to the apartment of one of the people who met us at the airport and relaxed there for a bit. Then, we went for a little tour. We headed over to St. Paul's Cathedral -- for the Mary Poppins fans, that's the location for the "Feed the Birds" song. Sunday services were almost over, but I was able to catch some of it. Outside of St. Paul's I shot the photo below. 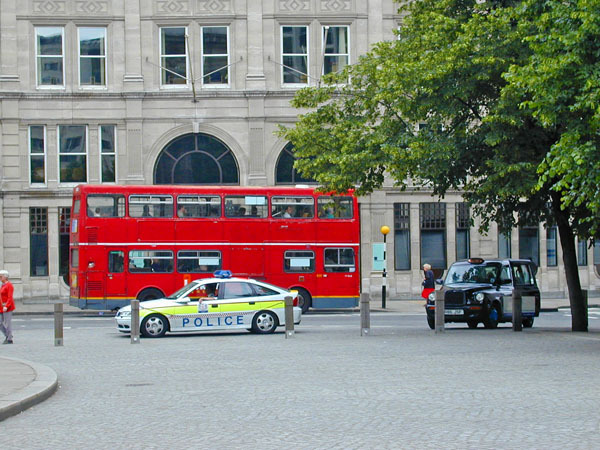 I meant to only take a picture of the double-decker bus, but I got what my English friends called "a very British picture" -- a double-decker bus, a police car, and a taxi cab. About 3:00 Sunday afternoon I was able to check in to the hotel and catch a couple hours of sleep. Later, a friend who was in the MLS program at UNT with me and is now living in London came over to visit for a while -- I also had brought a care package from her mom. Karen was able to accompany our group on one of our visits. Monday was our first work day. 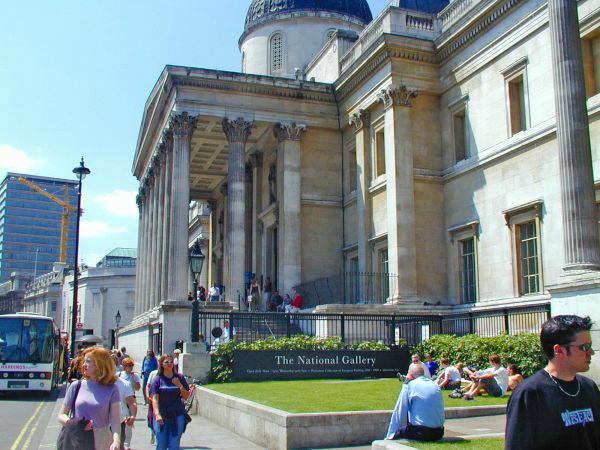 Our main job was to meet with a man at the National Gallery on Tuesday who is heading up their digitization project, so we used this day prepare. For the morning we visited the Tate Britain Gallery. 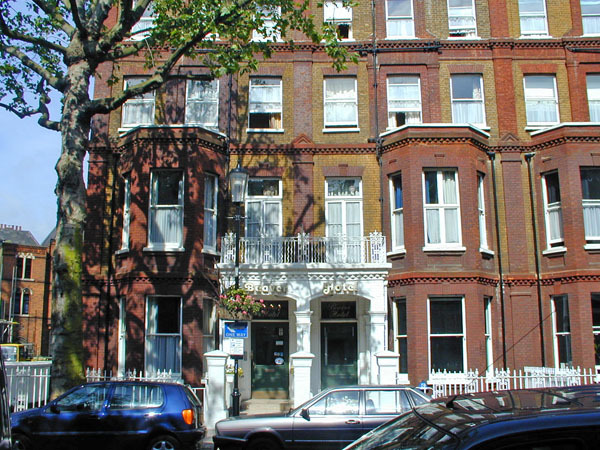 It is across the street from the Thames River and across the Thames from the MI-6 building (their CIA). That afternoon we took the "Arts Bus" over to the National Gallery and spent that time getting acquainted with some of their collection. 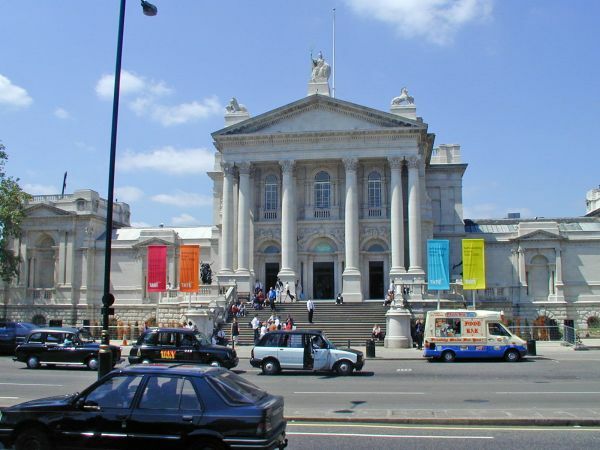 The National Gallery is on Trafalgar square and up the road from Big Ben. On Tuesday, we continued viewing the collection at the National Gallery and met with those responsible for the digitization project. However, while viewing the collection we saw the painting "The Execution of Lade Jane Grey." 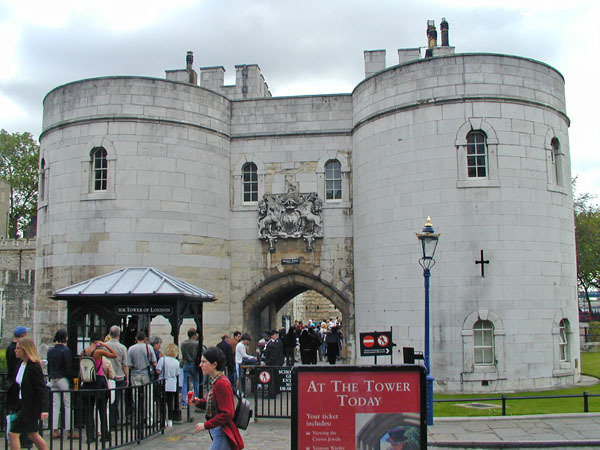 We felt some "historical context" was needed, so we traveled over to the Tower of London. 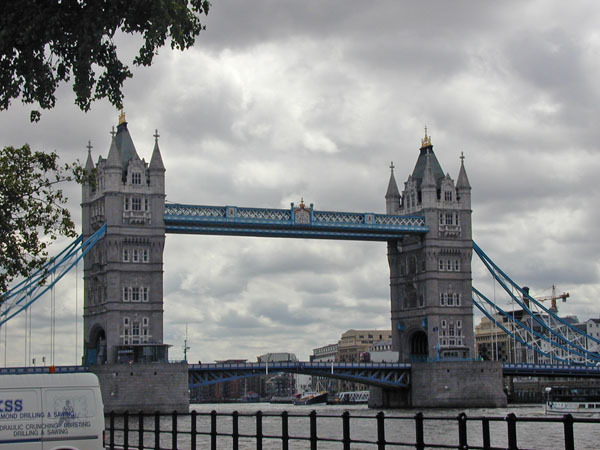 Of course, Tower Bridge is nearby. While waiting to catch "The Tube" back to the National Gallery, I got this photo. 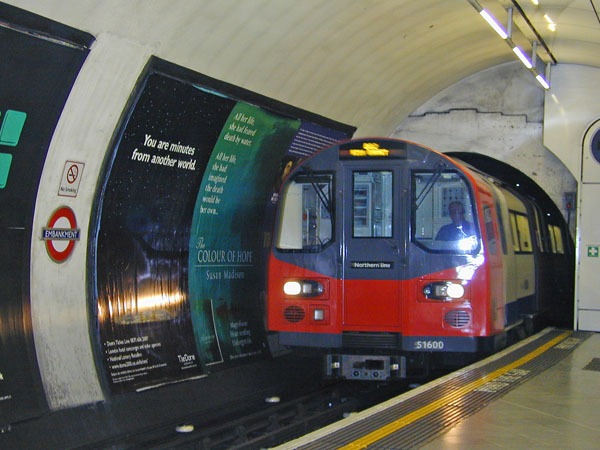 "Mind the gap!" 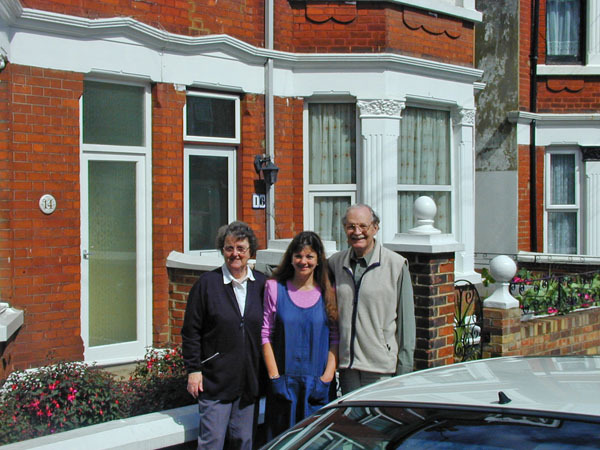 That afternoon I took a train to Gillingham in Kent to stay with some friends. Another friend, who was studying at Oxford, was there too. Wednesday was "play day." We had no business scheduled, so we were on our own. I had planned to go see Oxford with my friend, but allergies had me feeling poorly. 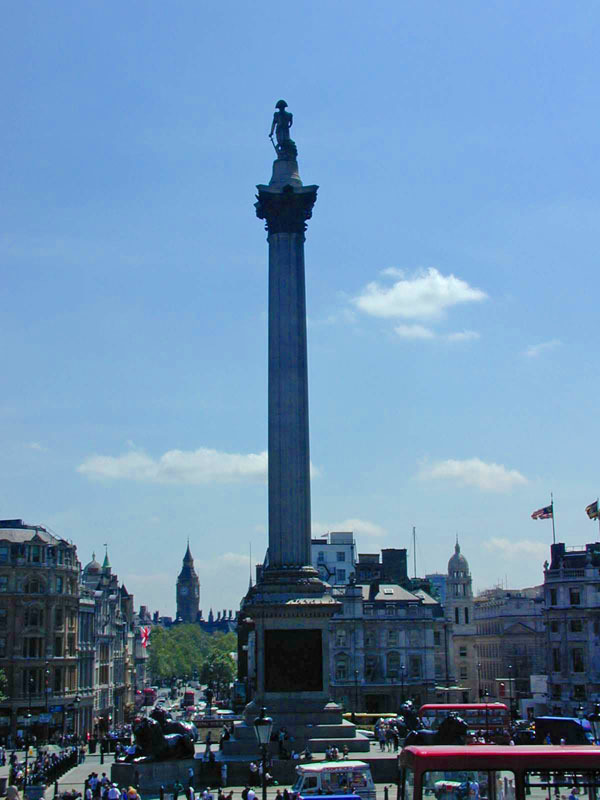 We stayed in London instead and saw some historical sites there. Our first stop was Bunhill Fields. This is a Dissenter's Cemetery. 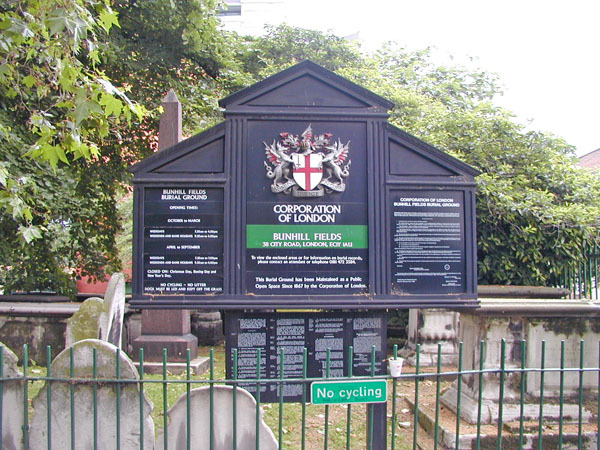 Only members of the Church of England could be buried in official cemeteries. People like Baptists and other denominations had to be buried elsewhere. Many famous people are buried here: John Bunyan, Isaac Watts, John Gill, William Blake, and others. 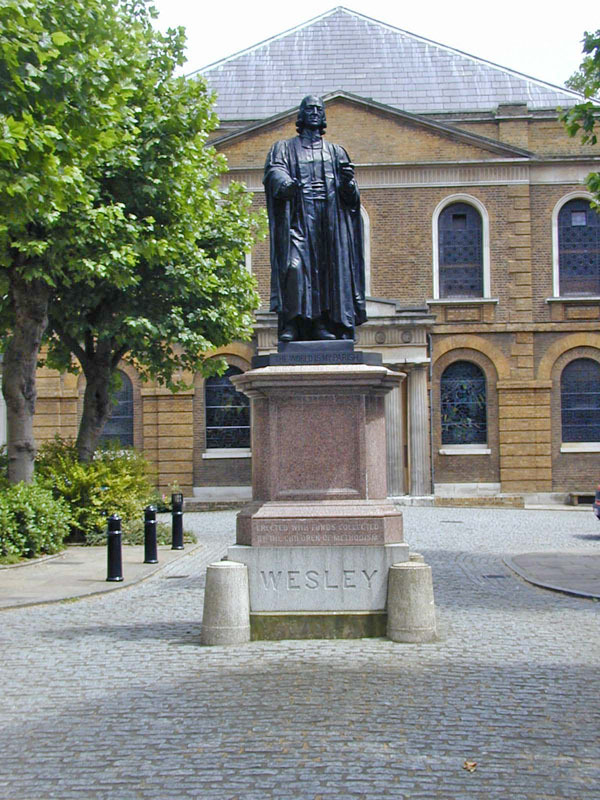 Across the street was our next stop: John Wesley's chapel and home. The chapel (right) is still a Methodist church, but there is a museum in the basement. Also, you can tour his home. That night, the group joined together for a "report time." The next morning half of us boarded our flight home. The others stayed a bit longer to do some additional touring. I would like to thank Dr. Samantha Hastings (my supervisor in the Certificate program) for the chance to go with the group to England. It was quite an experience which will be cherished for many years. I may go to England again, but this trip will always remain quite special.